Ebubeleni is geared mainly to self-catering,but full catering can be arranged on request.. Each room have hospitality tea, coffee, sugar and fresh milk available for your convenience. Our kitchens are fully equiped with all amenities and necessities. These include a fridge and freezer, microwave, oven, stove, extractor fan, kettle, toaster, etc. We have both indoor and outdoor braai/barbeque facilities - these are easy to operate. Complimentary wood is provided free of charge. If you would like your kitchen to be partially stocked prior to your arrival, please ask. This is also a service offered free of charge. 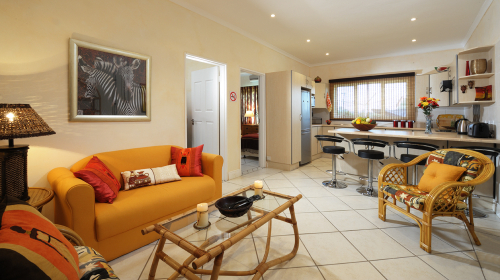 Feel free to enjoy your own cooked meals either at your accommodation or at the pool or in the entertainment areas. We have a full lunch and supper menu available for those whom would like to be spoilt and dine in.